It was another astonishing moment during the informational meeting last Wednesday. Moderator Craig Hammerman, District Manager of Community Board 6, asked, "Has the Police Department reviewed the arena plans with the same level of detail that they did initially, and have they offered you any comments that you can share with us?" Forest City Ratner's MaryAnne Gilmartin responded, "As the design is not complete yet, that review will take place, obviously, before the closing. But we’re in constant contact with the city, and expect to see the police department about the changes to the design in the fall." In the fall--meaning after the Empire State Development Corporation (ESDC) board in early September is expected to rubber-stamp the revised Modified General Project Plan (MGPP). The closing is simply the signing of contractual documents. Now the ESDC and FCR may not be required to consult the New York Police Department (NYPD) before the ESDC board votes. After all, security is not required to be part of the environmental impact statement (EIS) and, anyhow, the ESDC asserts that no Supplemental EIS is necessary. Rather, the ESDC claims that the only material changes for the agency board concern the terms of the deal for the railyards and the timing of eminent domain. Those are the ostensible subjects of the official public hearing Wednesday and Thursday. Meanwhile, project opponents and critics, pointing to the absence of a site plan and renderings, contend that a Supplemental EIS is necessary. As a practical matter, maybe the ESDC and FCR should consult NYPD before the ESDC board votes. 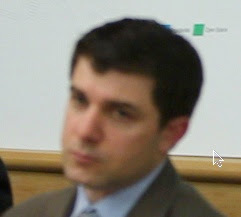 Indeed, as the screenshots show, the ESDC's Darren Bloch (left) and FCR's Gilmartin (below) seemed to express discomfort when being confronted with the security question. I can't be sure why, but I suspect it's because they know that the public deserves a little more than "trust us." The NYPD recommends that stadium and arena owners consult with blast engineers and the NYPD Counterterrorism Bureau to determine site-specific DBT [design basis threat] standards within the M3 range. That, apparently, has not happened yet. As Alan Rosner, co-author of July 2005 White Paper (PDF) on terrorism and security issues regarding Atlantic Yards, commented, "They have done more with this single publication than the five-year community and local elected officials' effort to get the ESDC to take this issue seriously." Remember, in May 2005, state officials said that the Freedom Tower would be significantly redesigned to address security issues--18 months after the design was unveiled. Frank Gehry's arena design would have been 20 feet from the street, given that it would have been flush to the sidewalk, and preliminary renderings of the new Ellerbe Becket design suggest it would be as close--though we can't be sure. ESDC officials have already said that streets won't be closed, even though they are closed outside the Prudential Center in Newark, which is 20 feet from the street. That is the same distance as the Newark arena is from its neighboring streets. So what’s different about the Atlantic Yards arena? That, [FCR's] Mr. [Loren] Riegelhaupt said, is a security question, to be directed to the Police Department. The Police Department has said that its policy is not to comment on such matters. For now, NYPD certainly can't comment--not even to assure the public it thinks the new design is fine--until it sees that design.